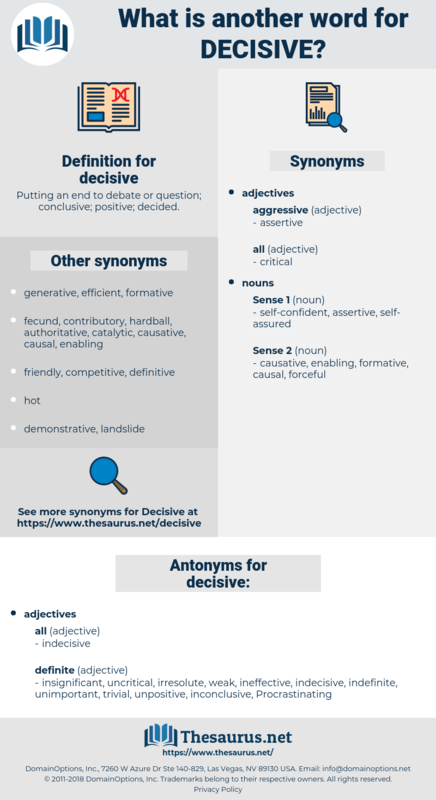 What is another word for decisive? Putting an end to debate or question; conclusive; positive; decided. 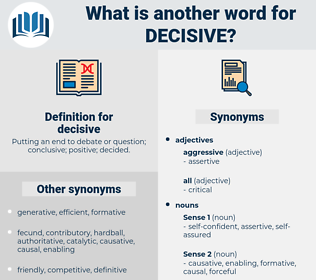 compelling, determining, decision-making, committed, decides, overarching, convincing, influential, proactive, decided, prominent, imperative, radical, specific, intent, resounding, Influencing, resolved, affirmative, meaningful, active, dominant, cogent, clear, Clearer. vital, definitive, determinative, pivotal, determinant, instrumental, essential, assertive, incisive, deciding, inconclusive, strong, definite, vigorous, conclusive, forceful, fundamental, Dispositive, energetic, deterministic, momentous, make-or-break, purposeful, bold, categorical, crucial, emphatic, drastic, authoritative, substantial, robust, seminal, fateful, considerable, aggressive, overriding, major, preponderant, overwhelming, effective, predicate, unequivocal, powerful, steadfast, central, tough, courageous, dramatic, hard-hitting, paramount, irrefutable, dynamic, staunch, final, incontrovertible, ultimate, predominant, critical, single-minded. irresolute, unpositive, uncritical, trivial, unimportant, ineffective, inconclusive, indefinite, weak, insignificant, Procrastinating. controversial, unresolved, disputed, irrelevant, wavering, unsound, ambiguous, indisposed, undetermined, unfounded, refutable, noncrucial, loath, disinclined, unconvincing, disputable, reluctant, unclear, on the fence, unpersuasive, uncompelling, questionable, vacillating, immaterial, groundless, equivocal, invalid, faltering, feeble, weak-kneed. The Decisive Trait of Faith. He stands before a decisive point in his life. Deja Vu, dig up, dash off, doze off, disobey, dissuasive, dysaphia, dice cup, death cup, doughboy, detoxify, deceive, disk shape, dish up, duck soup, disavow, death cap, deck up, DCCP, Dixie Cup, decaf.